Also known as Chromate Conversion, Chem Film, Iridite and Alodine. Chromates are typically applied to raw aluminum as well as zinc, cadmium, phosphate, and other plating, to passivate and provide a sacrificial barrier, and/or a pre-paint coating. Bare aluminum and raw plated zinc and cadmium will rapidly corrode without a supplemental surface treatment and chromates provide a significant amount of corrosion protection which is typically measured by a salt spray test. Generally, the darker the color the greater the protection provided due to a thicker film. 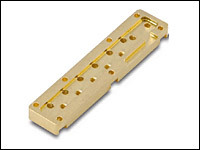 Specific plating specifications require chromates in clear, yellow, black, olive drab and other colors. 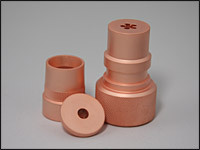 Copper is utilized as a stand alone finish, as a base layer that may be buffed for nickel and chrome, as a masking for heat treatment, and alone with a blacking agent for specific applications. Copper's electrical conductivity properties allow use for printed circuit boards and other electrical products. There are several types of electrolytic nickel plating including, black, bright, semi-bright, satin, and sulfamate (which has low stress values that increase ductility). Immersing stainless steels in specific solutions of acids removes residual ferrous steels from the surface that were acquired during fabrication, and creates a thin passive film on the surface on the stainless steel. The purpose is to eliminate the potential for galvanic cell activity between the dissimilar metals that creates corrosion. Tin plating has good electrical conductivity and is utilized on parts that require soldering, to increase anti-galling properties, for food containers as it is non-toxic, and for decorative or corrosion protection in a protected environment. Abrasive/Mechanical blasting uses many types of abrasives to remove surface oxides or an existing coating prior to a finishing process. A number of specifications call out very specific preparation methods, including non-chemical processes. These procedures may be required by either the hardness of the base metal or the bonding methods of the coating being applied. When hardened or high strength steels in excess of Rc 33 are cold worked, stresses are introduced to the parts. These parts must be stress relieve baked for a minimum number of hours at specific temperatures prior to the plating process. This phenomena occurs when high strength metals are subjected to cleaners, acids and plating baths that generate hydrogen bubbles. The bubbles seep into the laminations of the metal and concentrate at stress points creating an embrittlement, or high stress, condition that will cause the part to fail in use. 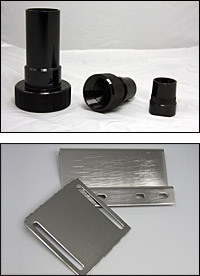 Specifications require individual baking times and temperatures for the plating process. There are low embrittlement plating processes and specifications to address this issue.